This wall picture Modern painting "Earth Construction" 200x60cm is a hand painted, not an art print. It consists of 4 panels with a width of 200 cm (without spaces). Brown and Beige are the main colours of this picture. The painting is stretched on a wooden frame and is ready to hang. The sides are painted in neutral grey. No additional frame is required. The artist Nick Santoro lives and works in Potsdam, the capital of the Brandenburg region. Christian Rose (his original name) is head and co-owner of Paintings XXL. 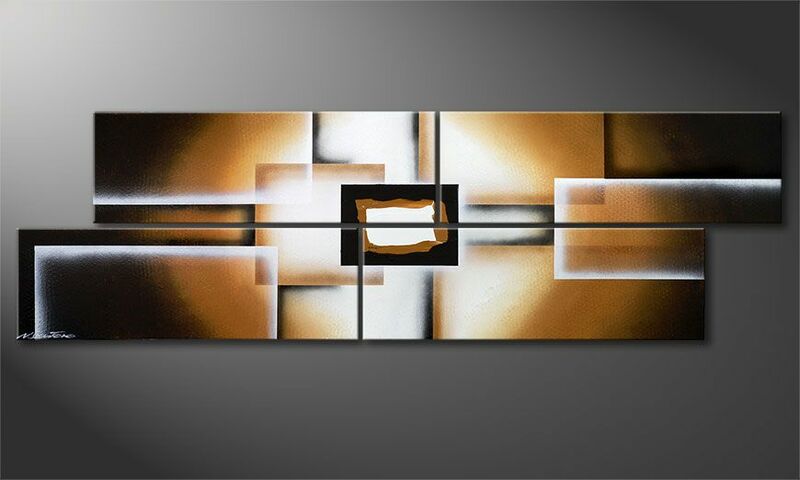 Nick Santoro is driven by his ambition for creating outstanding and ever improving wall art. His paintings convince by versatile painting technqiues he has personally developed. He loves to experiment and play with form and colour; however, his true passion lies in three-dimensional effects which complement most of his paintings. The large quantity of sales ond positive feedbacks express the great popularity his wall art enjoys. The painting is stretched on a 3/4 inch thick wooden frame. We only use high-quality acrylic paints and thick, professional artist canvas (400g/m²). The sides are painted in neutral grey, so no additional frame is required. The painting is ready to hang. Super Bild - macht sich wirklich toll an unserer Esszimmerwand. Lieferung hat etwas über eine Woche gedauert wegen hohen Andrangs. aber ansonsten alles top! Lieferung erfolgte sehr schnell und im sehr guten Zustand (Umverpackung). Super Bild, kommt sehr gut zur Geltung - ich bin begeistert. Kann ich jedem weiterempfehlen. Vielen Dank nochmal.